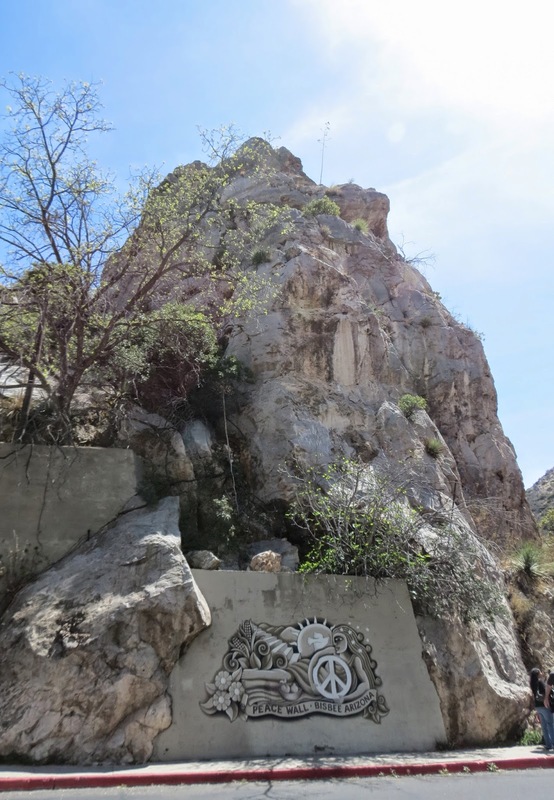 In 1877, army scouts were sent to the Mule Mountains to search for renegade Apaches. What they found instead were signs of copper. 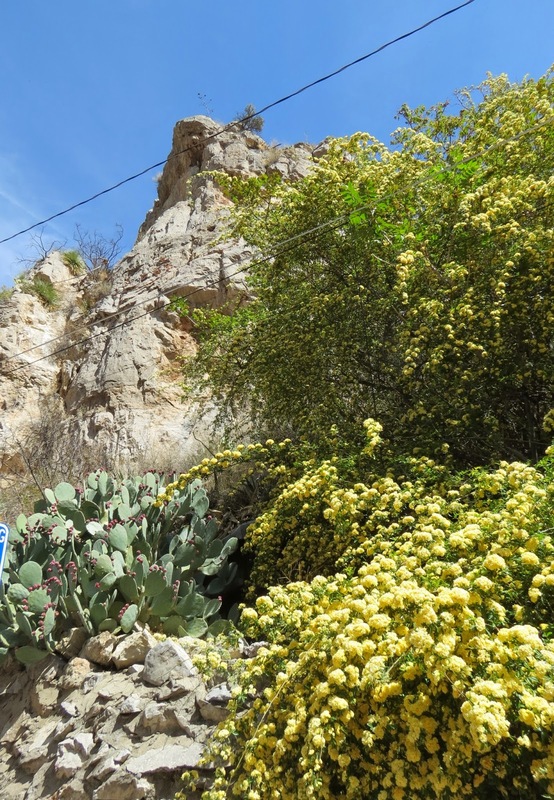 The first mining claim was staked in what would later become the city of Bisbee. Evidence of that copper history is the first thing you see as you approach the city from the East. The city was named in honor of Judge DeWitt Bisbee, a major financial backer of the mine. 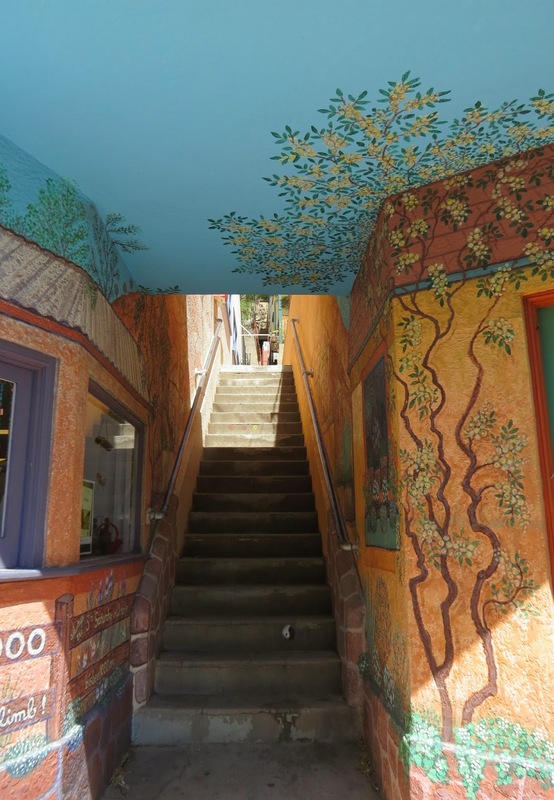 The mines closed in the 1970s, but old Bisbee can still be found in what has become an arts and crafts center, retirement community, and tourist attraction. 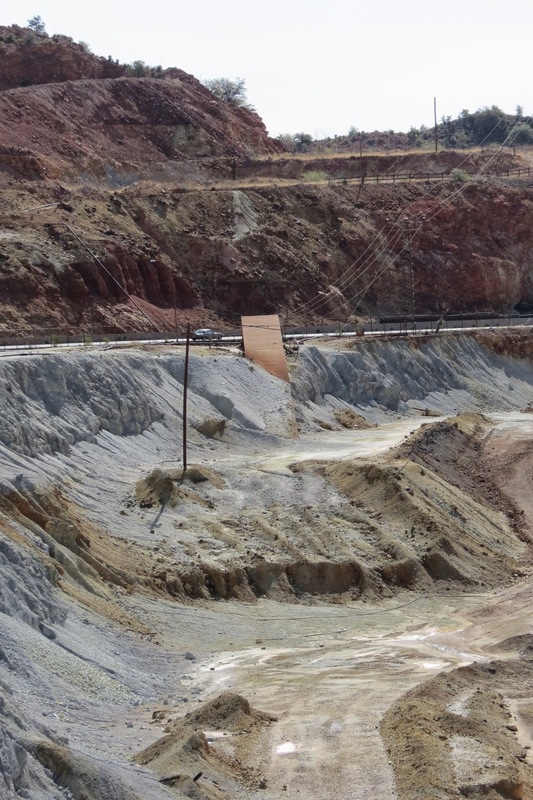 The first obvious stop is at the huge open pit mine itself, known as Lavender Pit. The pit is 4000 feet wide, 5000 feet long, and 850 feet deep at its maximum, shown here. More than 300 different minerals can be found in these hills, identified by color. The red is sufide minerals that have been oxidized; gray is granite that contains small amounts of copper; lavender is limestone comglomerate that contains no copper, and is considered waste material. The Lavender Pit name was not named for the color. It was named after Harrison Lavender, a former general manager of Phelps Dodge Western operations. Remains of the crusher that crushed large chunks of ore into smaller rocks. Conveyor belts carried crushed rocks to this concentrator that separated metal from rock. The resulting "concentrate" was sent to a distant smelter for further processing. Aerial view of the mines: 1. Sacramento Pit, 1917-1929; 2. Lavender Pit, 1950s-1970s; 3. Holbrook Extension, mined late 1960s-1970s. Our next stop was the Queen Mine and Visitor Center. Underground tours are offered of the Queen Mine, but we passed on that in favor of the walking tour of the historic area. Birdie looking over some of the old mine equipment. 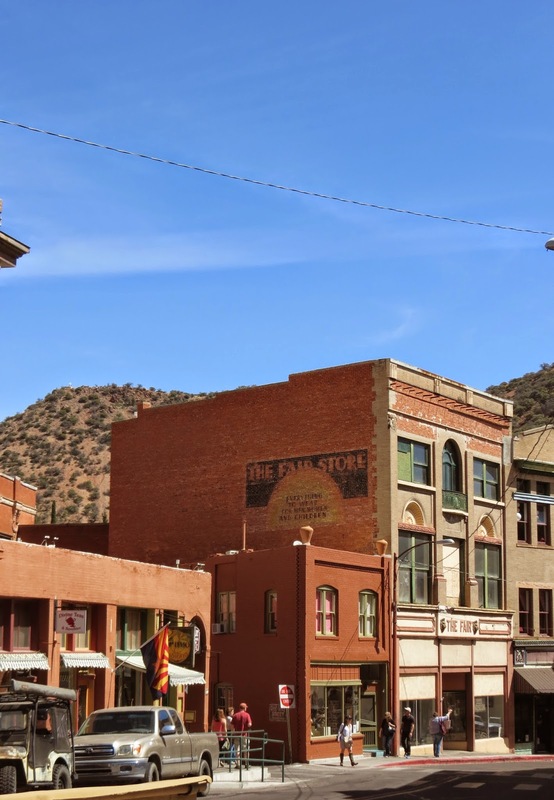 A brief history of Bisbee and the surrounding area. 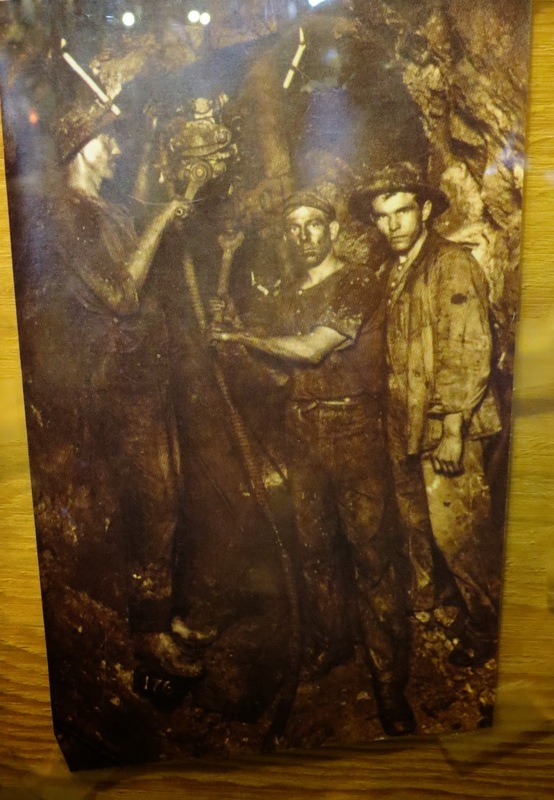 Photos of the old mining days. Dioramas of the early mines. 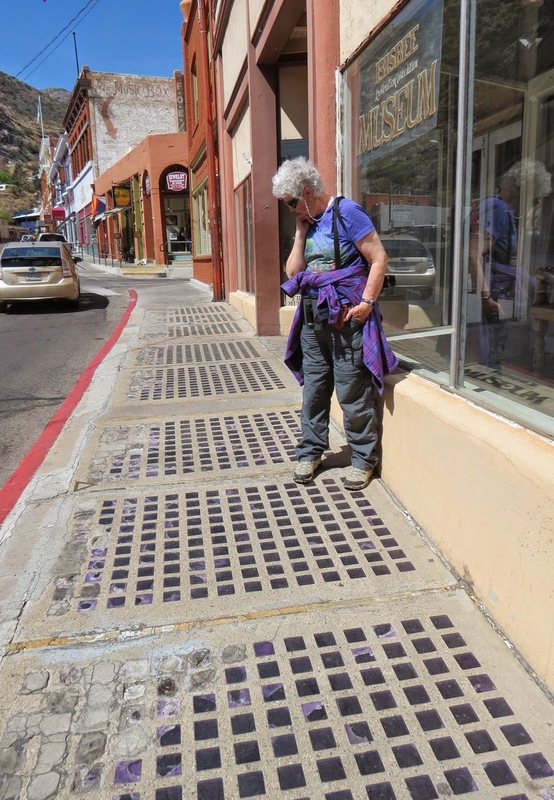 With our guide to the Old Bisbee Walking Tour in hand, we set out on foot. You can see that much of Bisbee is built on the hillsides. Bisbee City Fire Hall...a combination City Hall and Fire Station. The streets are very narrow. 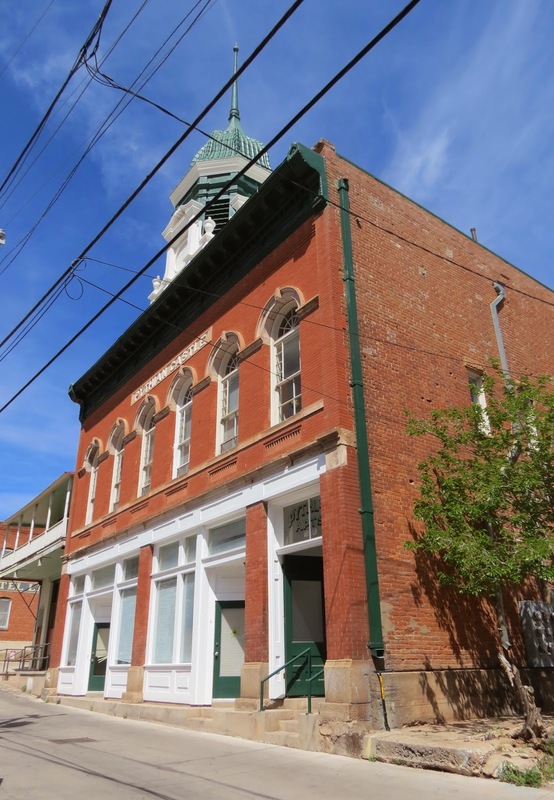 The original (1897) Phelps Dodge Mining Company Office building now houses the Mining and Historical Museum. 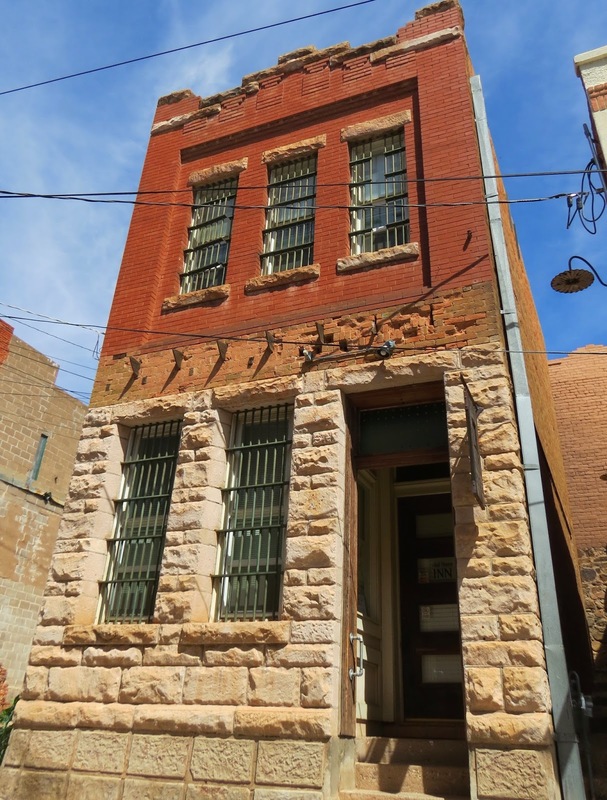 Built in 1905, the ground floor of this building is a Post Office, the upper floors housed the Copper Queen Library, now the Bisbee Public Library, said to be the state's oldest continuously operating library. 1902 Bank of Bisbee. The two marble columns were added in 1906. 1898 Copper Queen Dispensary/Clinic, built when smallpox was a problem. Peddlers Alley is still a busy place. 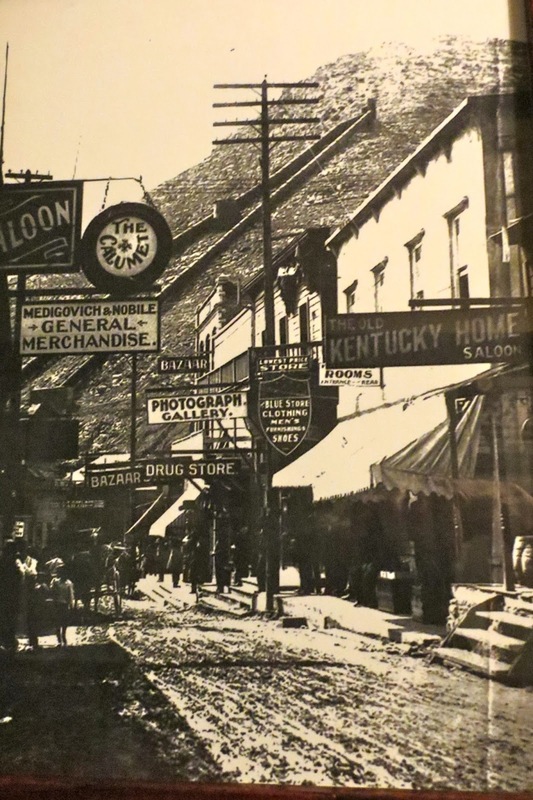 The two buildings that comprise Letson Block are the oldest documented buildings on Main Street. James Letson built the adobe building on the left in 1888 to house the Mansion House Hotel, and the right building in 1894 for the Turf Saloon. The first Goldwater store occupied this site before the buildings were rebuilt. 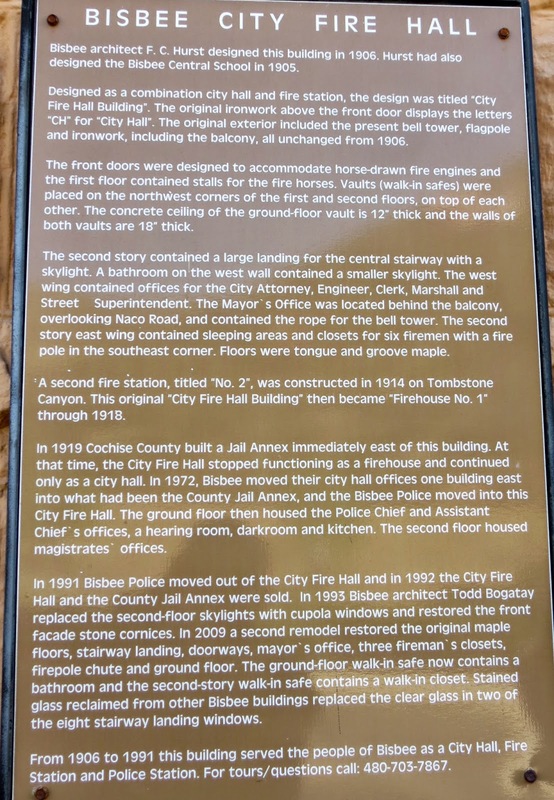 The Bisbee Massacre of 1883 took place in front of the Goldwater store after a gang of bandits robbed the store and murdered 4 people. 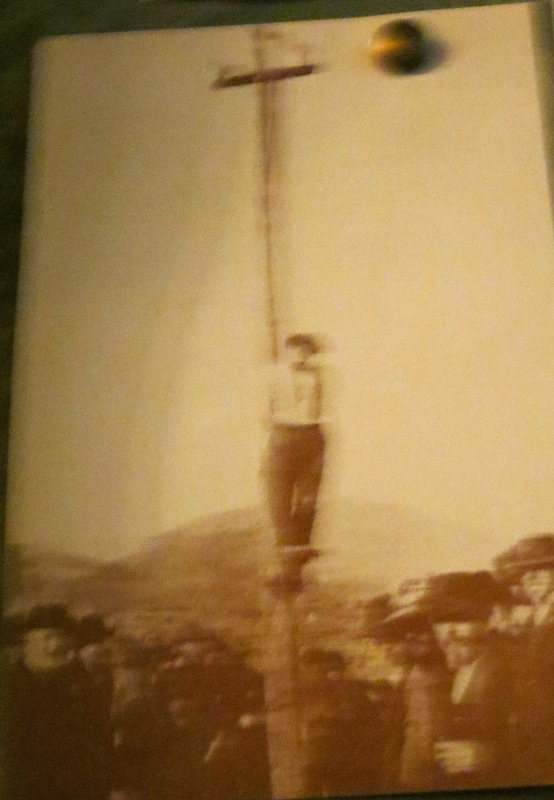 Five men were later executed and became the first criminals to be legally hanged in Tombstone. Their graves are in the Boothill Cemetery there. This building housed the Woolworth store. 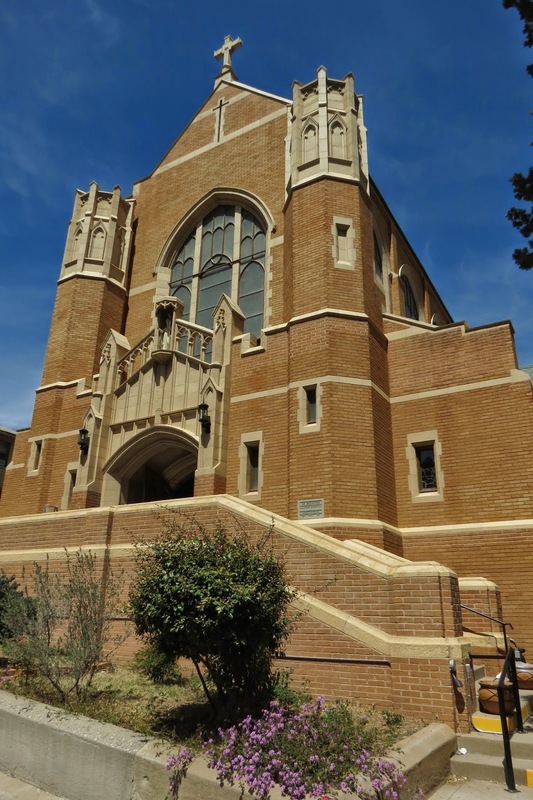 It was constructed with hydraulically pressed brick imported from St. Louis. The bricks held up against the great fire of 1908. You can see the difference in the brick. Woolworth building with the compressed brick is on the left. 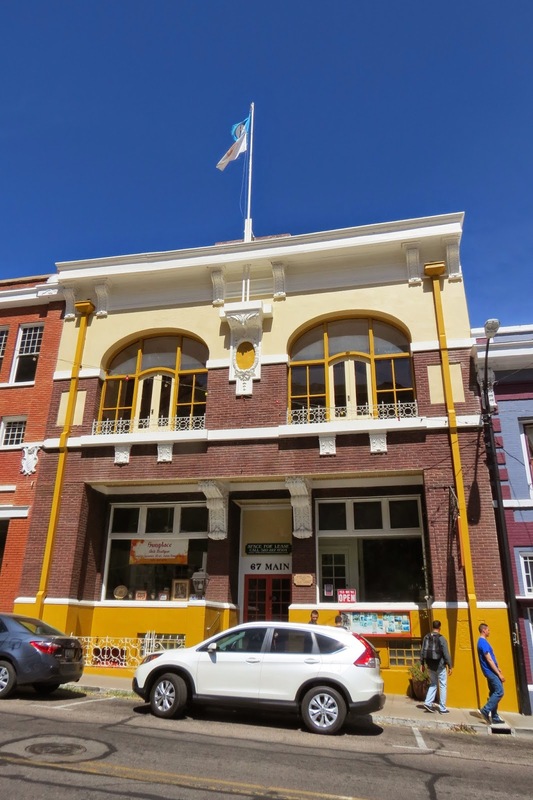 This 1917 structure replaced the original Fair Store which was destroyed by fire in 1908. The glass blocks in the sidewalk served as skylights for the basement. The one-story building on the left of the Fair Store was the Jack Building, 1909. It held an early telegraph office. Not on our tour, but a grand old hotel just the same. Elks Lodge, built in 1910 to replace the original which burned in the 1908 fire. Rebuilt in 1909-10 after the fire of 1908, this building housed the Palace Livery Stable. Carriages were kept on the first floor, and horses were hoisted by elevator to the second floor stables. Today it houses an antique store. We found out the elevator that hoisted the horses still exists, so went inside to see. Looking down the horse elevator shaft. Looking up at the pulleys. Looking around at the antiques on the second floor that used to be stables. 1850s Cleveland Ohio Corner Chair...for my "antique" friends, lol. Not all the old buildings were described in the walking tour brochure. 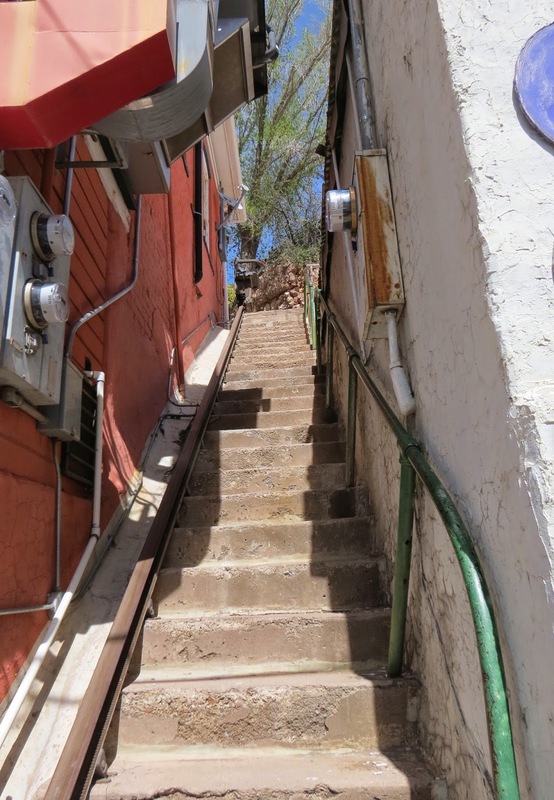 Being mostly built on hillsides, you might imagine all the stairs in Bisbee. 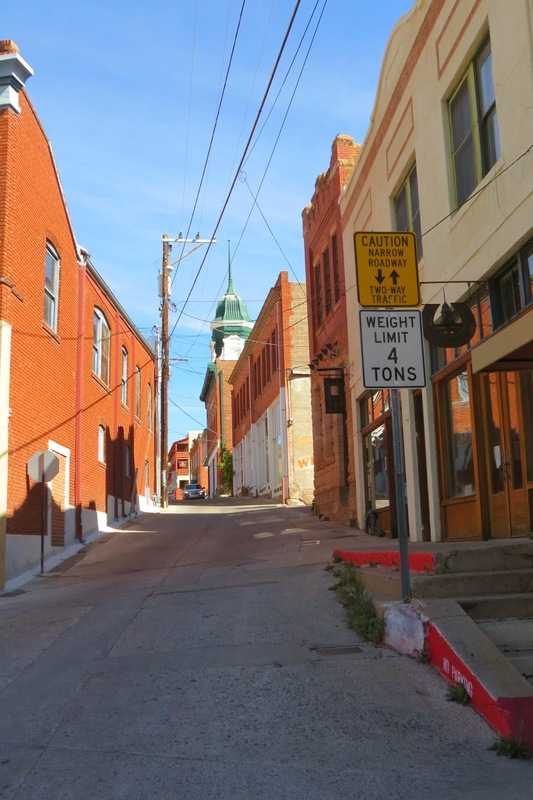 Modern Bisbee has turned this into a fitness challenge held each October. 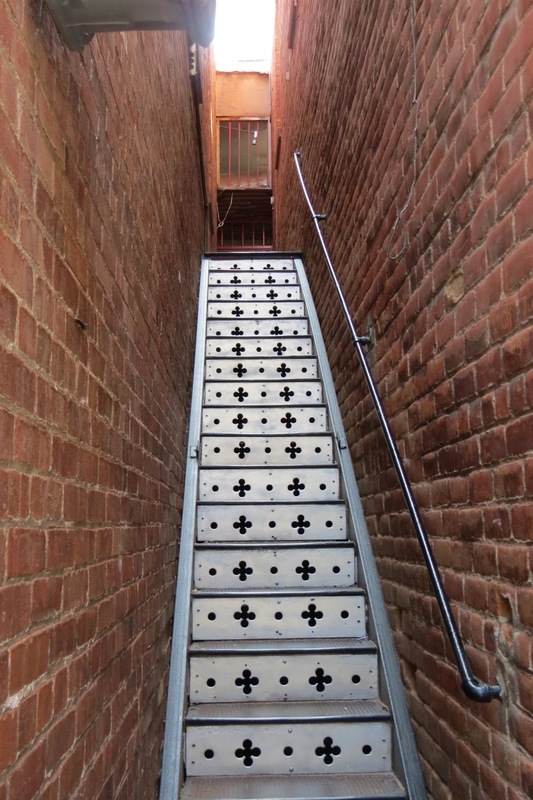 It is called the Bisbee 1000, Great Stair Climb. It is the oldest and only outdoor Stair Climb competition in the USA. Many of the stairways have been decorated and the number of stairs is marked. It is still in use by the Masons. Glad I don't have to carry my groceries up there. Wild roses growing below Castle Rock. 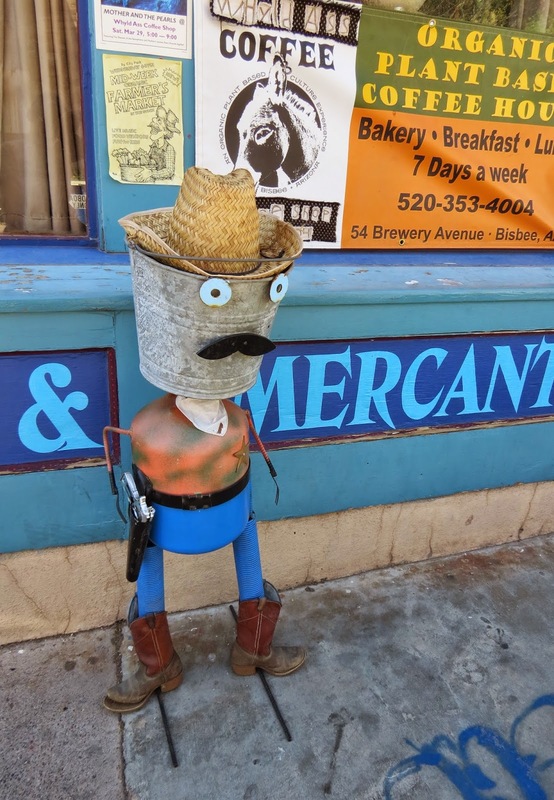 Lots of folk art can be seen around the city. But at $2.50 a bite, we didn't buy anything. 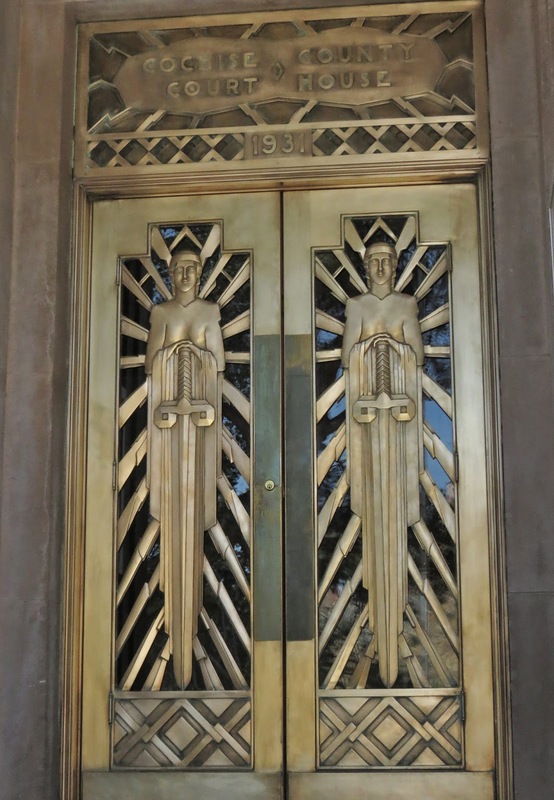 The Courthouse is known for its solid copper doors. 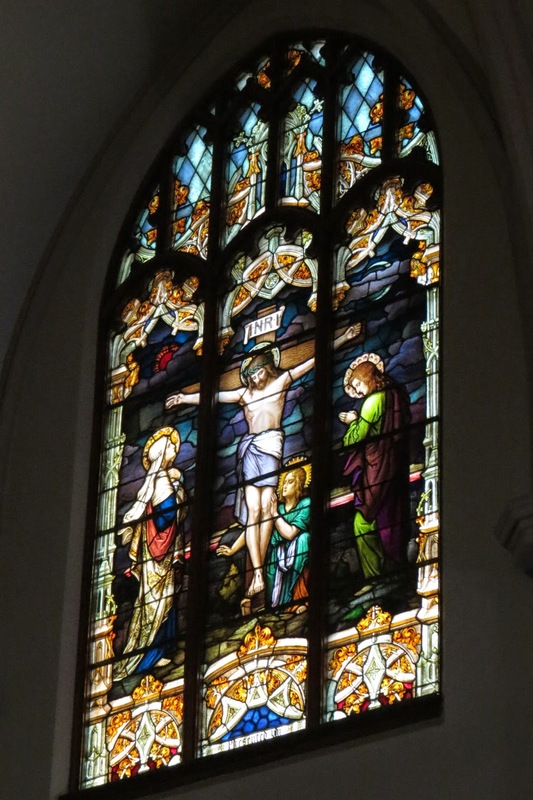 The lady at the Visitor Center recommended we go inside St. Patrick's Church to see the stained glass windows. The church was built in 1916. Looking down the hill from the church. One of the storekeepers recommended the Market Cafe for lunch. Good choice! Most of the businesses are dog-friendly. The cafe had a bowl of water in the outside dining area for patrons who brought their dogs. Birds appreciated it too. Some people who were up to the stair climb challenge today. Birdie took the challenge....about 10 stairs worth, lol. This building is powered by solar panels. After lunch we took some narrow back streets to another part of town....the old Brewery District. Small house on the hill. Artsy entryway to this house. Looking down on Brewery Gulch, once notorious for saloons, brothels, and gambling houses. Now it's a collection of shops and art galleries. One of the city parks built on the hill. Coming down the stairs is not bad. Brewery Gulch...popular with bikers and other tourists. More folk art found here. 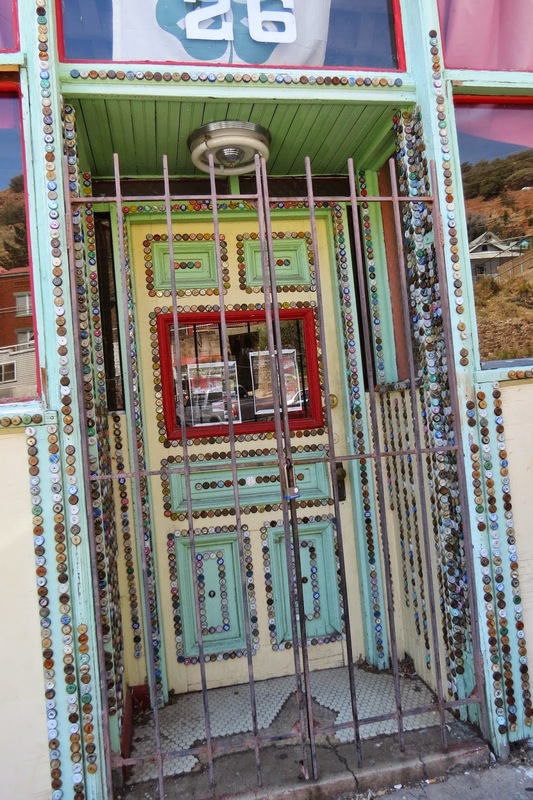 Storefront decorated with bottle caps. The 1909 Hermitage Saloon burned in 1976 and has not been rebuilt. Cellar of the burned Hermitage Saloon. 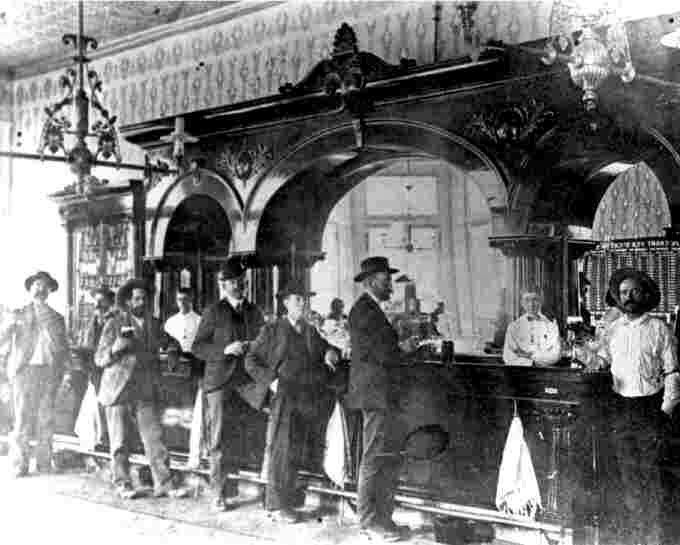 The bar inside the Hermitage Saloon in 1900. This narrow gap between buildings has a stairway to housing. 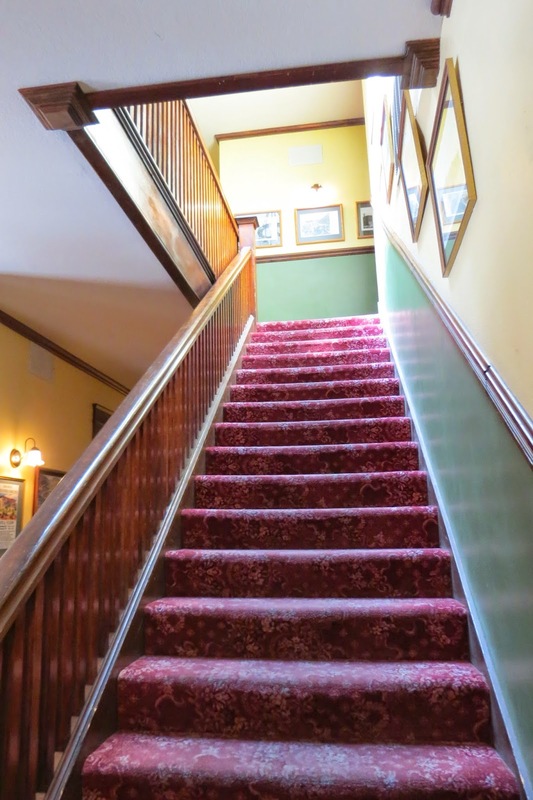 Both Theodore Roosevelt and John Pershing stayed at the Copper Queen Hotel, built in 1902. More of the lobby...a lot of historical artifacts in here. Photo of the hotel in 1902. 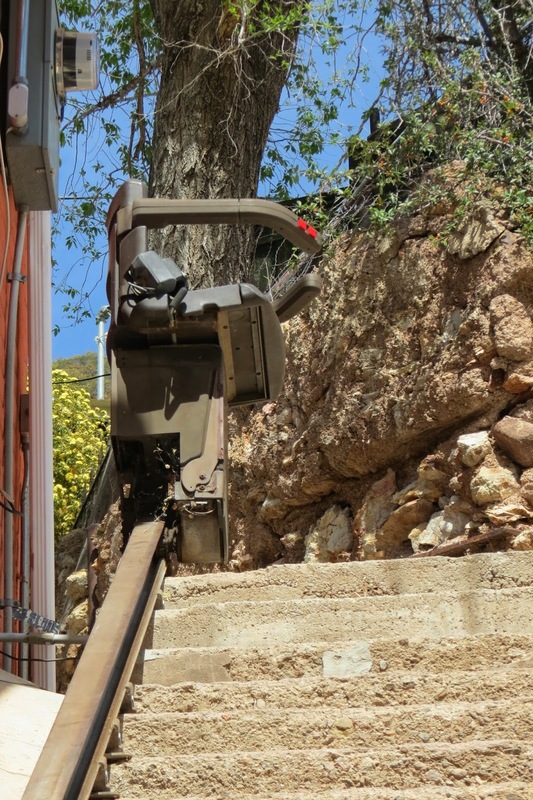 With all those stairs, I know the people of Bisbee were happy to see the trolley arrive. A picture from the fire of 1908 that destroyed much of Main Street and the Tombstone Canyon housing district. Photos from the old mines. Someone important must have been coming. There were a lot of hotels in Bisbee. Many have been renovated into apartment buildings. The Hotel La More, aka Hotel Bisbee still operates as a hotel. Part of it is open for touring. Small hotel kitchen and dining area. Transom window located above the door. Hotel Bisbee on the left. Here's a house on the hill for sale...room for your canoe/kayak, although I'm not sure where you'll use it. And when you get too old to climb the stairs, this one comes with a chair lift. Love this picture tour! From 1946 to 1975 my bachelor Uncles, retired miners, lived in the dusty apt. on the 2nd floor, in the 2-story building to the left of The Fair Store on Main Street. So many stories & family history in Bisbee. Wish I knew more about the building they lived in for so long.